BONUS: Receive double the amount of Calling Cards FREE! 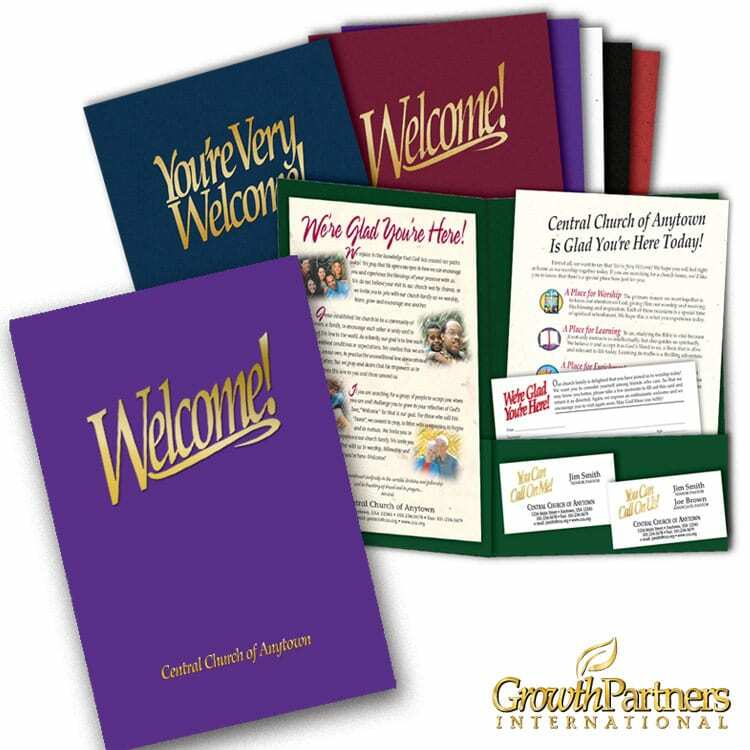 Prices shown here include printing your Church Name or Logo on the outside of your folders in rich gold foil! Leaflet Style Choose an optionA: "We're Glad You're Here"B: "...Is Glad You're Here Today"
Set-Up fee applies to any first-time order of Customized Folders. This is a one-time charge for set-up and creation of your custom magnesium die. Email your artwork to art@growthpartnersintl.com. Please send Vector Artwork. Accepted formats are .ai, .eps or .pdf. If you need a new logo created – call 800-357-4769 for a cost estimate. Enter your custom imprint info. Remember to email your artwork to art@growthpartnersintl.com. Accepted formats are .ai .eps or .pdf. A proof will be sent to you via e-mail before production. Custom Folders may take 2-3 weeks for production. Minister information will be printed on Calling Cards only, unless otherwise noted in the Additional Information or Questions field. ie – Pastor, Senior Pastor, Minister… Minister information will be printed on Calling Cards only, unless otherwise noted in the Additional Information or Questions field. The name of your church EXACTLY as you wish it to appear on your printed materials. Address of your church or meeting location EXACTLY as you want it printed on your product. Write EXACTLY as you want it printed on your product. What phone number or numbers would you like printed on your product for your visitors to reach you at? Would you like a fax number printed on your product? What email address or addresses would you like printed on your product for visitors to reach you? Enter any additional information or questions regarding this particular product here. We will review any special requests or questions and respond as soon as possible.